Recently I realized that I keep writing about and recommending trying a bath of hanging greens for parakeets without actually giving instructions for how to make the bath. 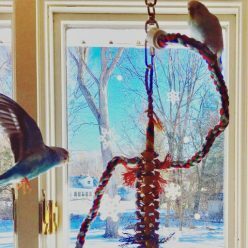 I know for my husband and me there was definitely some trial and error involved, and the errors could involve some parakeet injury, so here are some best practices for making a hanging bath. At the grocery store, get a bunch of greens and a package of bamboo skewers (commonly used for grilling, like these: Kabob skewers PACK of 500 8 inch bamboo sticks made from 100 % natural bamboo – shish kabob skewers – (500) ). As far as the greens go, what you really want is a good sturdy leaf that will stand up to some abuse without tearing immediately. Equally important is the stem width, they have to be thick and not prone to shredding. We really love kale for baths, and also mustard greens. 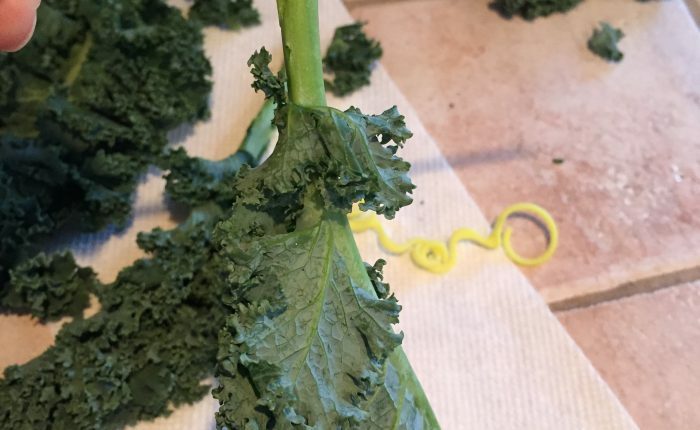 Take a stem and poke a hole through the thickest part with the bamboo skewer, repeat this process for 4 or 5 leaves, until you have a good bundle of greens. Thread the leaves on whatever attachment you have handy, we are using one that came from an inexpensive toy (JW Pet Company Activitoy Olympia Rings Small Bird Toy, Colors Vary ). You could also use paper rope (Outus Raffia Paper Craft Ribbon, 1/ 4 Inch by 100 Yards ) and tie it securely to a spare metal toy clip, or a plastic clip. Whatever you have that you can hang will be fine. Wet the bundle of greens thoroughly – get them soaking and be prepared to soak the bottom interior of your cage. If you use paper at the bottom that is not water resistant it would be best to remove that entirely to make for easier clean up at the end. Hang the bundle from the interior top of your cage; if possible, position is near some perches for a jumping off point. Hopefully your parakeets will instinctively “get it”, but if not, don’t be discouraged, just keep offering the greens and they will probably explore them eventually. I also try to leave the greens in the cage for a couple of hours and will refresh them with a spray bottle. Parakeets are definitely fans of a routine, so try to offer a bath in the same sequence each week. We get home from the grocery store, put everything away and then it’s bath time. I find that a series of steps that are done in front of them the same way every time helps them know what to expect and really aids in getting them excited. And finally, here is Toby enjoying her bath, this is not as “into it” as she typically gets, I think she was being a little camera shy, but you can see how it’s suspended and how she moves around the bundle in a way that she couldn’t if it was laying on a flat surface.